True ownership of one share of Atlanta (Liberty) Braves stock framed like you want. The recipient becomes a real shareholder of the company. Perfect gift for an Atlanta Braves fan! The replica certificate is based on the company's original certificate design in the 1960's. 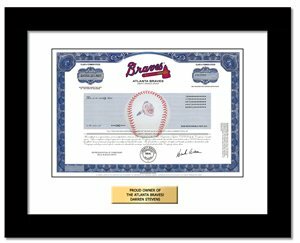 The Braves stock certificate incorporates the company name, logo, and Hank Aaron's printed signature. Owner of the Atlanta Braves professional baseball franchise. In April, 2016 Liberty Media created this spin out. The Liberty Braves Group Class A tracking stock, through its subsidiary, Braves Holdings, owns and operates Atlanta Braves Major League Baseball club.